Happy Halloween! | A Daily Dose of Zen Sarcasm! Yes, it’s that time of lovely spookiness and mischief! The time to dress up, pretend, and kick back… and eat loads of candy. And the time of the year to reveal THE SCARIEST BABY SHOWER PRESENT EVER! You know there is always the one kind of strange present that you perhaps would have never picked for yourself and might not make it in all its original components to your child’s nursery. But this is far, far worse. Do not stare into its eyes for longer than a couple of ill-fated seconds. I REPEAT: DO NOT! Thanks to Nutz for use of her demon troll pic. Now go and bury that thing! Much evil lurks in those cursed with the troll face. Need I remind you that those evil Olsen twins also creepily resemble the Troll Doll? You have been warned. HAPPY HALLOWEEN ONE AND ALL!!!!!! 31 Oct	This entry was published on October 31, 2005 at 4:55 pm and is filed under Domestic Bliss, Onerous Onomastics. Bookmark the permalink. Follow any comments here with the RSS feed for this post. 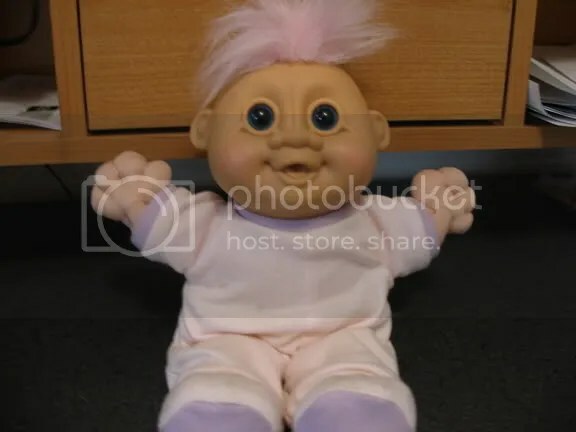 We were also given a similar troll as a gift for my newborn son. I was horrified! I was equally horrified when it became one of his favorite toys. He loved to grab the hair, and be tickled with it. It did finally fall out of favor, as he developed some taste, but it was a big hit for many months.